The 1951 Festival of Britain showcased achievements in science, technology, industry, architecture and the arts in venues across the country. Much of what was built for the Festival was dismantled at the end – but there are some remarkable remnants. As well as personal memories and mementos passed through families, the Festival survives in a number of intriguing and unexpected places. Reg and Joy Bond, who had come to the festival from New Malden, Surrey. Image kindly supplied by their granddaughter, Becky. Part of the Festival of Britain was a ‘Live Architecture’ exhibition in the Stepney / Poplar area of London. Nearly a quarter of buildings in the area had been destroyed or damaged in the war, so the Lansbury Estate was selected as the perfect site for regeneration. The Susan Lawrence School was the first building to be reconstructed, as a living example of post-war planning and architecture. The Architectural Review admired the tilework as a way of providing a colourful, hard-wearing finish, and saw the school as an unusual architectural example of the new interest in child-size, practical spaces. Founded in 1856, Liverpool’s Lewis’s became the flagship to a chain of nine influential department stores, and at one point owned London’s Selfridges. As one of the first city-centre businesses to start rebuilding after the war, the new Lewis’s featured interior designs influenced by the Festival of Britain. ‘The 1950s were a difficult but also hopeful time for people emerging from the restrictions and rationing of wartime, and living and working surrounded by bombsites, as many people were in Liverpool. The designs of the 1950s were an attempt to banish the drab and down-at-heal. The Council for the Preservation of Rural England and the National Association of Parish Councils (NAPC) suggested that the building of bus stops would be an appropriate way for small parishes to celebrate the Festival of Britain. A design competition was set up, and stipulated that local materials be used ‘so that the structures will fit harmoniously into the surrounding landscape’. Gerald J Green’s design for a bus shelter at Farmington in Gloucester won him a prize of £100. This was the first building he had ever designed. The stylish, evocative reliefs that feature on the side of what is now a branch of clothing retailer Zara, depict subjects relating to the Festival of Britain. The building is one of the first to be constructed in the capital after the Second World War, and displays a traditional style between the 1930’s and 1950’s. The Festival of Britain Logo, designed by Abram Games, is represented on the third floor, with the Festival Hall above and Dome of Discovery, Skylon, and musical instruments below. ‘Youth’ was created by Daphne Hardy-Henrion, an established figurative sculptor. It is unique achievement in getting concrete so thin without cracking. The lithe sculpture was part of the South Bank Exhibition at the Festival of Britain, sited outside the ’51 Bar, which was designed by architect Leonard Manasseh. At the end of the Festival, Manasseh and Hardy secured ownership of the sculpture, saving it from removal to the Arts Council’s depot. In 1959 it was installed in the garden of Manasseh’s home in Camden, London. Barbara Hepworth’s pair of semi-abstract figures in blue limestone was created for the Festival of Britain’s centrepiece exhibition at London’s South Bank. Sited outside the Dome of Discovery, ‘Contrapuntal Forms’ was described as a ‘monumental group of abstract sculpture symbolising the spirit of discovery’. After the Festival, it was acquired by the Harlow Arts Trust and installed on Glebelands, a residential street in the New Town, in 1953. Parliament Square was remodelled post-war by architect GG Wornum, as an open and elegant space to enhance the setting and views of major historic buildings. Now within the Westminster World Heritage Site and Conservation Area, the square was also intended to control the flow of traffic and pedestrians in light of increased volume of visitors to the Festival of Britain. The Sunbathers, by artist Peter Laszlo Peri originally greeted Festival goers at Waterloo station. Amazingly – 66 years later it was discovered in the garden of a hotel in Blackheath, London. Our crowdfunder to restore the sculpture and put it back on public display has had an overwhelmingly positive response – thank you to everyone who has got involved. If this is the first you’re hearing about it, there’s still time to find out more and donate. Together we can Save the Sunbathers. Do you know about another Festival of Britain survival? Tell us about it in the comments! A remarkable (related) survival is not far from the Festival of Britain site at 99 Southwark Street SE1 – Kirkaldy’s Testing & Experimenting Works, where chains supporting the Festival of Britain’s Skylon (1951) were tested. Both the building and the huge Universal Testing Machine are listed Grade II*. You can visit Kirkaldy Testing Museum as part of London History Day on 31 May 6-8pm, bit.ly/LHDKirkaldy To survive even longer the museum needs friends and volunteers – come along and get involved – and keep the family’s motto (carved over the door) alive, “Facts not Opinions”! There is a Festival of Britain wall hanging by Michael O’Connell at the Museum of English Rural Life in Reading. That’s wonderful – thanks, David! 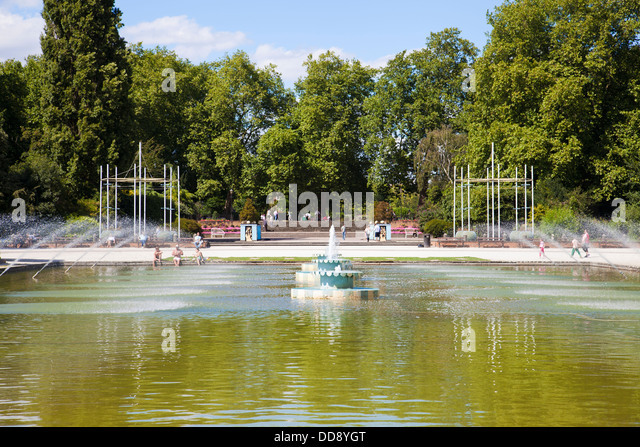 These Fountains in Battersea Park: http://l7.alamy.com/zooms/b614aed2ea364af691a46d53e920dde7/battersea-park-fountains-london-uk-dd8ygt.jpg are all that are left of the Festival Pleasure Gardens. Reblogged this on Pictures for Schools. I don’t know anything about Festival of Britain survivals. I wish you to restore the Sunbathers. The dioramas of life in Britain at various historical moments (e.g. Anglo-Saxon, Roman, Tudor etc) which were part of a travelling exhibition for the festival of Britain are still on display in Leicester’s Jewry Wall Museum. Fabulous snapshot of how people thought the past looked in 1951! The lights on Albert Bridge were added in 1951 for the Festival of Britain. Jack Howe was responsible for the lighting for the Festival which included Albert Bridge. Already on the HE list is a mural at Woodberry Down Primary School, designed by Eric Brown and Augustus Lunn, which was part of the Seaside exhibit at the Festival.